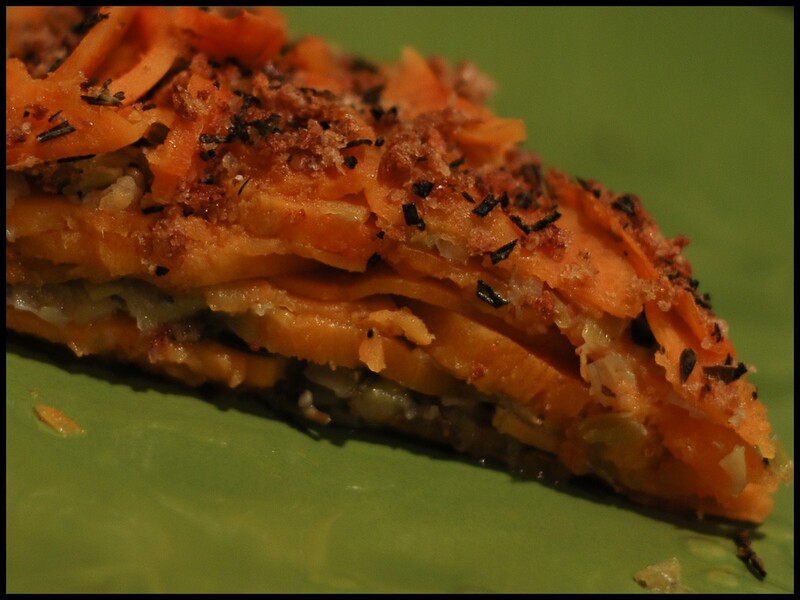 Here’s the second recipe from Vegetarian Times for 2011; it’s also from the January/February edition, like the kale lasagna. It’s topped with breadcrumbs, but you could make it gluten-free by leaving those off, and I think it would still be pretty good. 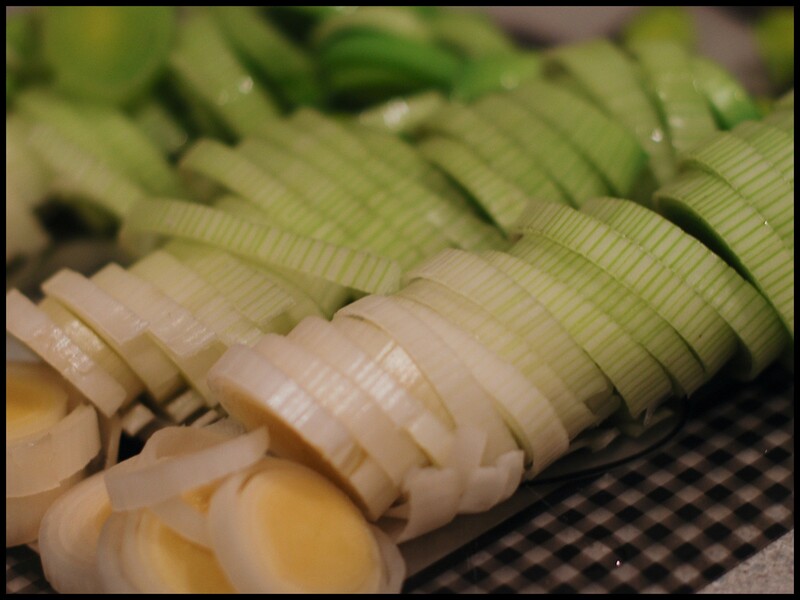 Here’s the thing: the recipe calls for 3 medium leeks, so that’s what I got, but it says they will come to 6 cups chopped. My 3 medium leeks only amounted to 3 cups (26.9 ounces, to be exact), so I’m not sure if there was a misprint in there or if I just needed to buy bigger leeks. 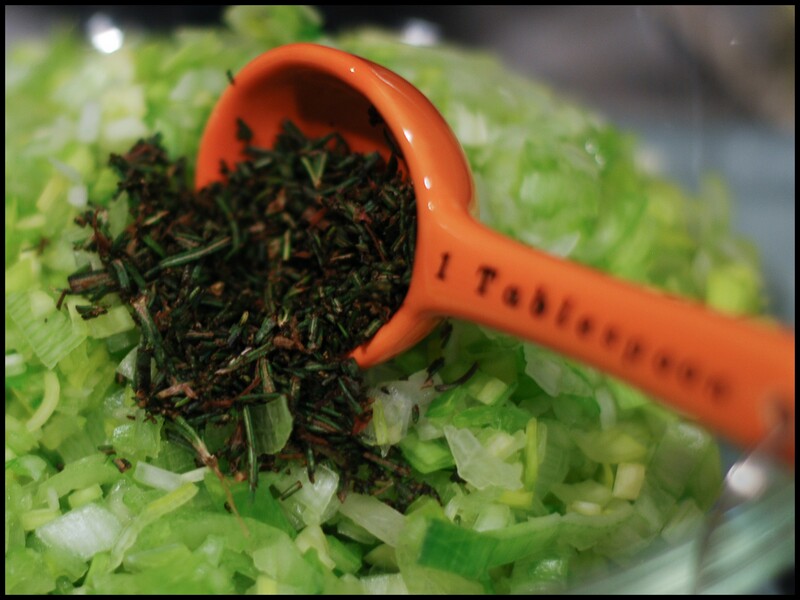 The whole time I was making it I wondered if it was going to be overpowered by all the rosemary since there only seemed to be half as much of the leeks in there. Next time I make this I’m going to have to try it with twice the amount, so I can see the difference. I considered only using half the rosemary, but decided to just go with it and see what happens. I forgot to pick up some breadcrumbs, so I made my own, using this recipe, but since I was out of garlic powder I had to use garlic salt. SO…instead of using salt, I just used a half teaspoon garlic salt and when I ran it for stats I called it 1/4 tsp. garlic powder and 1/4 tsp salt…not exactly right, but you can do it however you want. And WHOA – check out those beautiful stats down below – it’s even high in iron! 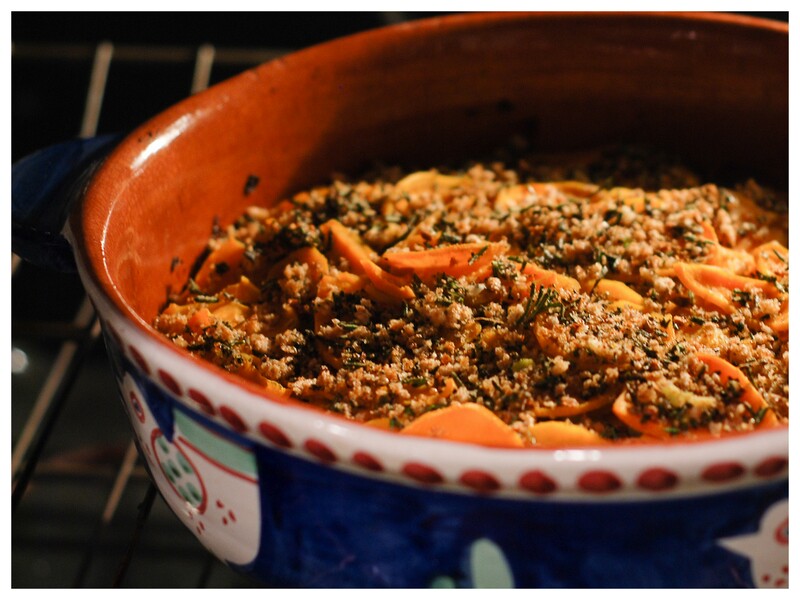 Another low-cal and nutrient dense recipe from the VT! WHOOHOOOOO! 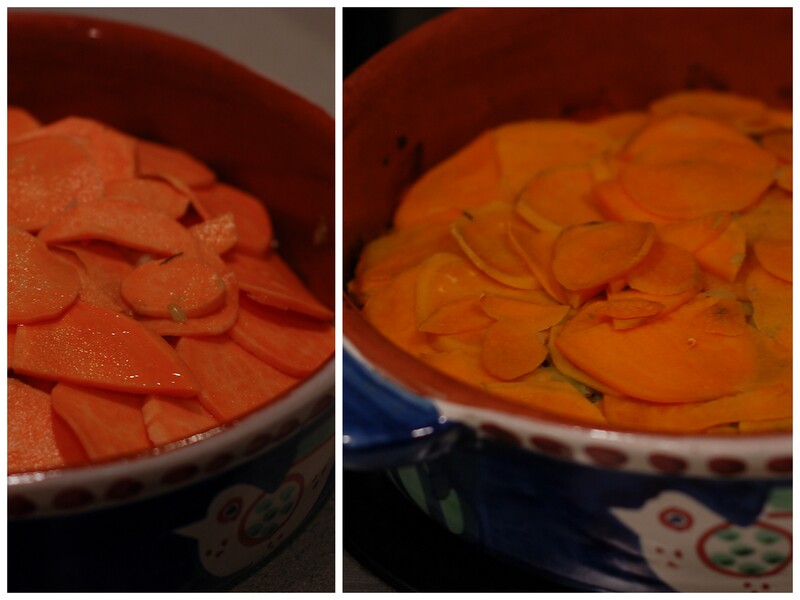 After slicing, it’s a good idea to wash them again, since they get some serious dirt in between those layers. 2. Heat 1 T oil in skillet over medium-high heat. 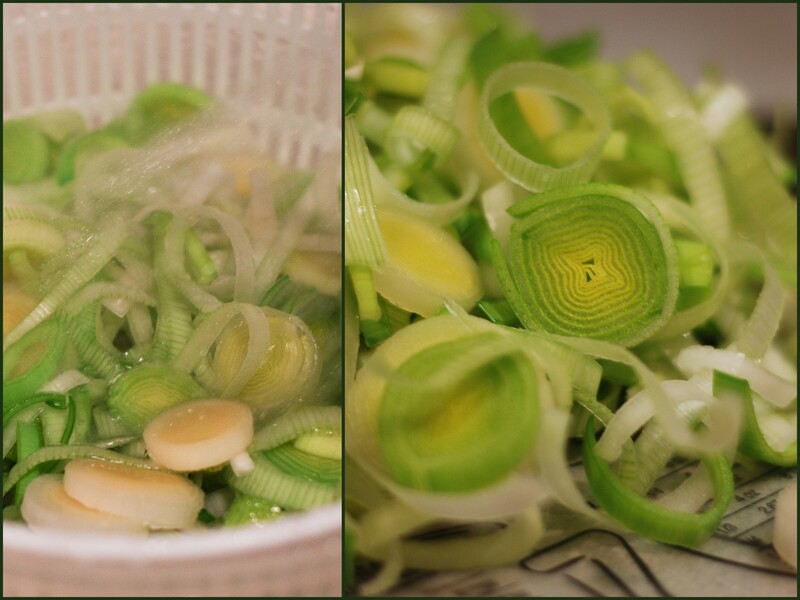 Add leeks, garlic and 1/5 T rosemary; saute 8 minutes, or until softened. Season with salt and pepper, if desired. 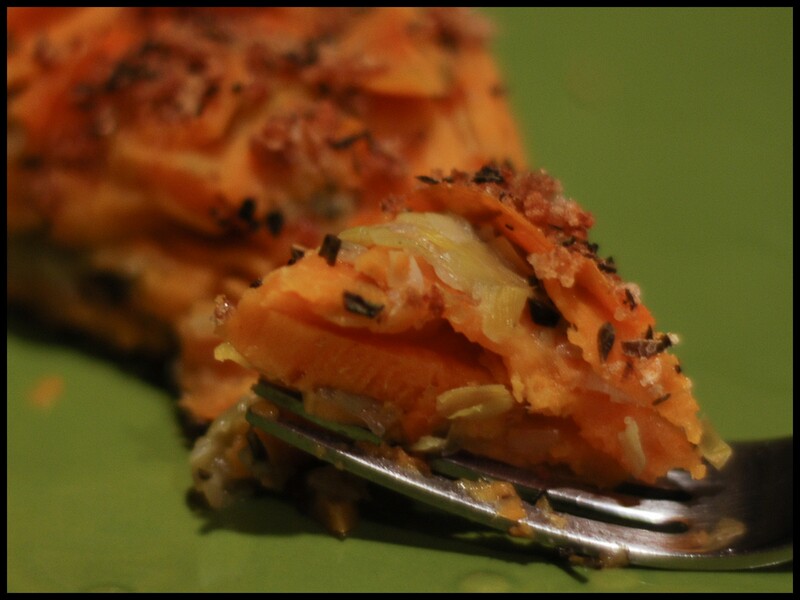 (I didn’t) Arrange 1/3 sweet potato slices over bottom of casserole, overlapping slightly. 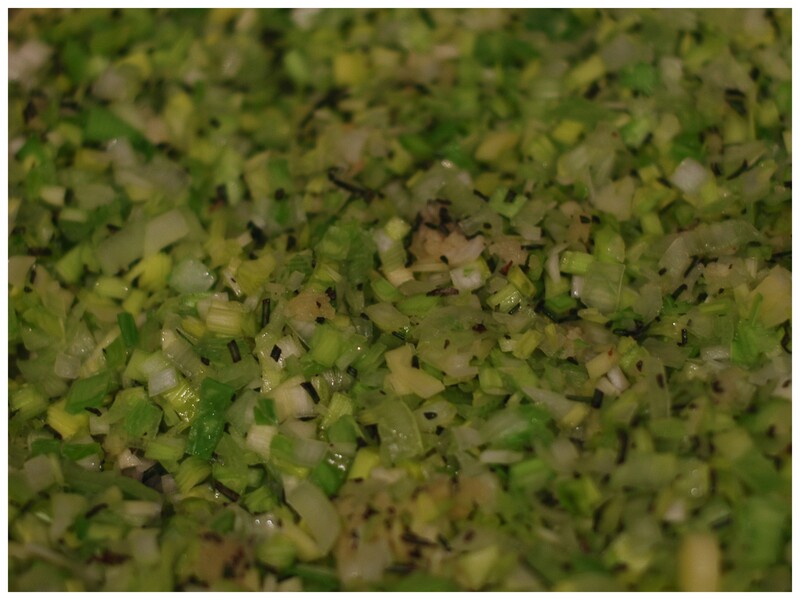 Spread 1/2 of leek mixture on top. 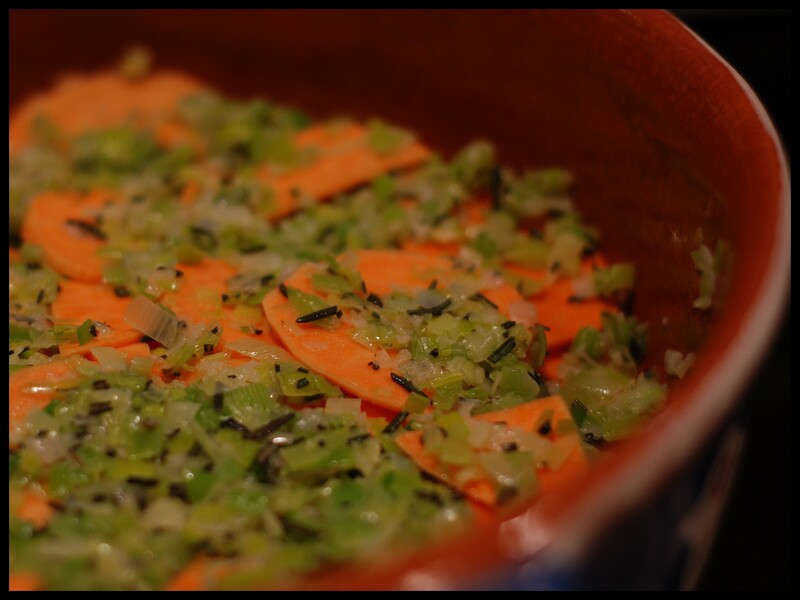 Arrange another 1/3 sweet potato slices over leeks; top with remaining leeks, followed by remaining sweet potatoes. Drizzle broth over top, cover pan and bake 35 minutes. My stepson woke up from a nap and asked me if I had onions cooking. It smelled so good. 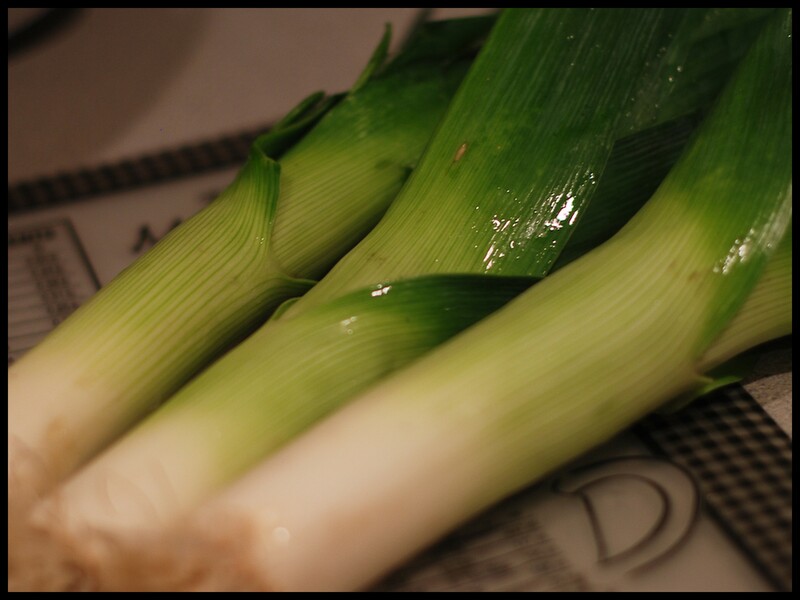 Leeks have a sweeter smell when they cook than regular onions. 3. 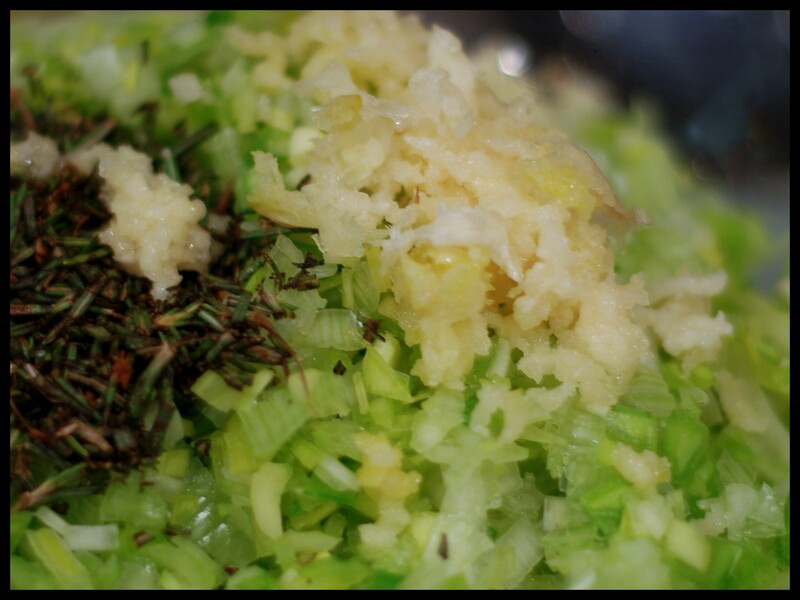 Stir together breadcrumbs, remaining 1 1/2 tsp oil, and remaining 1 1/2 T rosemary in small bowl. Remove cover of dish and sprinkle breadcrumb mixture over top. Bake, uncovered, 15 minutes, or until breadcrumbs are browned and crisp. 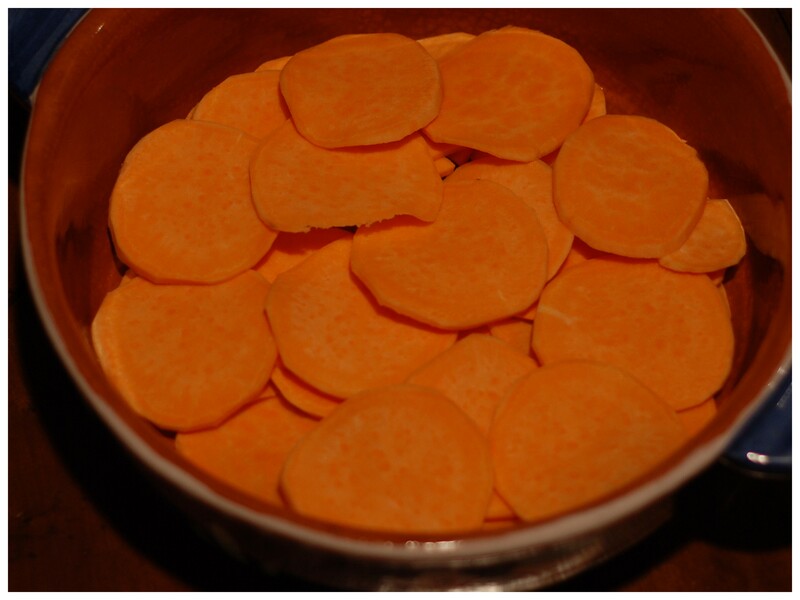 Let gratin cool slightly before cutting into 8 wedges. This recipe is a little time-consuming, but if you take the time to make it on the weekend, you can enjoy it through the week. It’s always nice to have something like this prepared ahead so all you have to do after work is just heat it up! 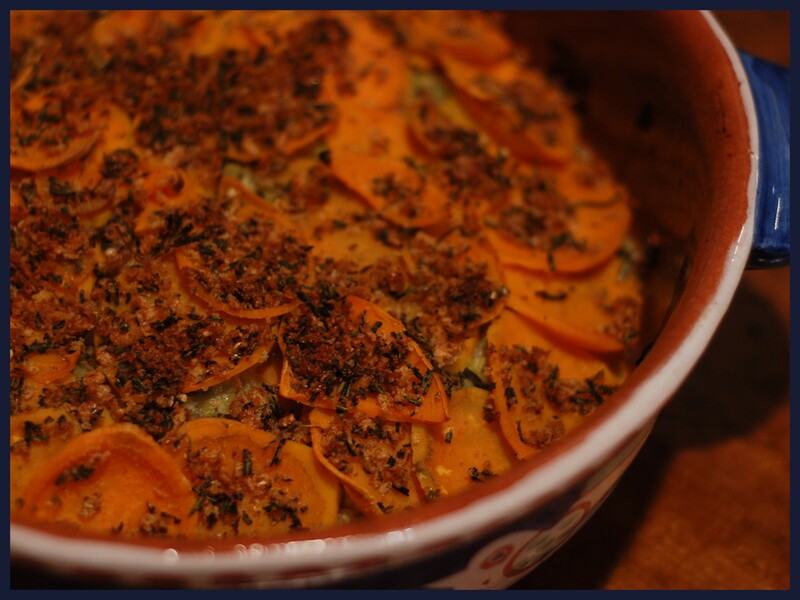 I tell you what, though: it would be nice to have a mandoline – it would have made slicing up those sweet potatoes go a lot faster!